“What we really need is to establish an ethic of clean water practices.” I urge you, and I ask you, to spend today establishing our ethic: that clean water practices are every Minnesotan’s responsibility. That anything less is unacceptable. And that it’s achievable if all of us do our part.”– Minnesota Governor Mark Dayton, Water Summit, St. Paul, February 27, 2016. 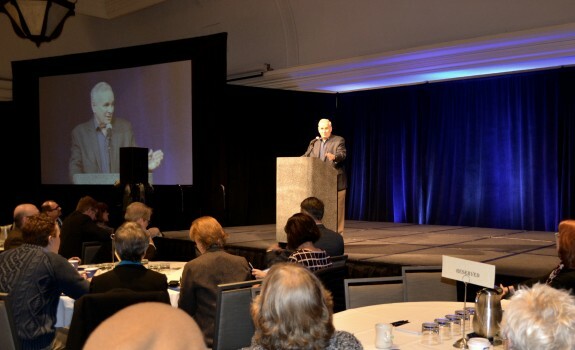 Eight hundred Minnesotans joined Governor Mark Dayton last Saturday, February 27, for the Governor’s Water Summit at the Intercontinental Hotel in downtown St. Paul. 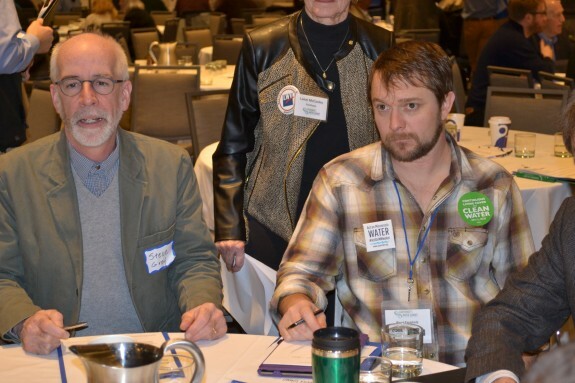 In spite of fierce competition for admission to the summit, CURE and Land Stewardship Project (LSP) brought 70 member-delegates from across Minnesota to St. Paul. Governor Dayton’s office stated that the guiding principle for the summit was to: BE READY TO TALK ABOUT SOLUTIONS! …..that the summit wasn’t for finger-pointing or blaming others for the problems facing our lakes, rivers, and drinking water. Dayton stated that he was calling on all Minnesotans to be part of the solution, that attendees should come ready to share their ideas. The CURE/LSP delegation took the governor’s request seriously and came to the summit prepared to advance solutions-based recommendations in all nine breakout-sessions. Delegates also came prepared to advance one big recommendation on behalf of both groups. CURE and LSP called on Governor Dayton to announce a state goal of adding 20% more living cover on farmland by 2020. Currently cover crop use on Minnesota’s agricultural land is less than 2%, on 25 million acres under cultivation in Minnesota. With 75% of that land cropped for corn and soybeans, the state’s two main crops are covering the soil for only about 110 days each year. For the rest of the year, farmland is left exposed and unprotected and vulnerable to soil erosion and runoff. 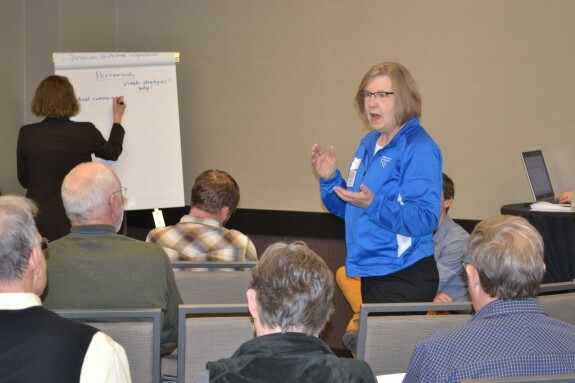 CURE and LSP urged Dayton to direct his state agency commissioners to shift resources and focus on reaching the 20% continuous living cover by 2020 goal as the best way to get started to address nitrogen runoff pollution from farmland that currently pollutes Minnesota’s waters. CURE hosted a table at the summit that provided staff a great opportunity to reconnect with CURE members. Photo by Scott Tedrick. 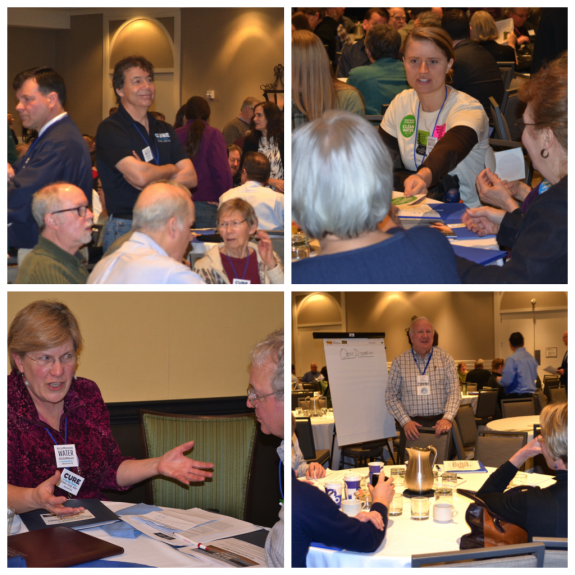 Granite Falls Advocate Tribune editor, Scott Tedrick, captured a few diverse perspectives in his article about the various perspectives, solutions and otherwise, he saw at the summit. CURE Executive Director Duane Ninneman pointed to the federally subsidized agricultural system as a major culprit in propping up practices that force farmers to act against their own interest. Ninneman also said that he would like to see the Governor establish benchmark standards for environmental improvements so that, even if they’re not (fully) met, individuals have an opportunity to strive toward a particular goal in a group fashion. Read more of the article here. 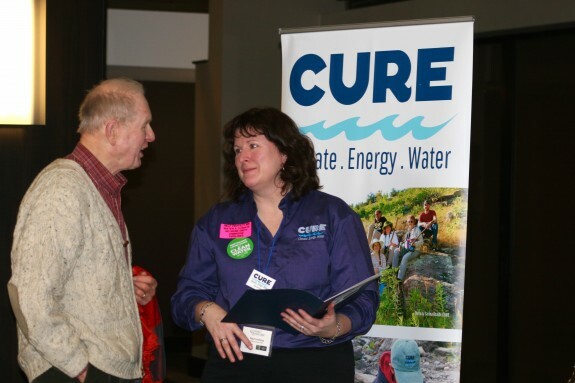 Act on Minnesota Water is CURE’s 2016 statewide campaign to focus public awareness on the decline of Minnesota’s water quality and to take action to protect and restore our water resources for current and future generations. Minnesotans say that water is our state’s most important natural resource. “It’s as Minnesotan as apple pie to mouth support for clean water, which makes for a puzzling disconnect from the inconvenient fact that the quality of the state’s legendary waters is spiraling in decline.” – Ron Way, Star Tribune, February 5, 2016. Campaign Goal – To work collaboratively to raise awareness and to educate the public, key stakeholders, and decision makers about our state’s water quality and water quantity problems. Minnesota’s water belongs to all of us. Water is essential for life, and is critical to the health of our environment, communities, industries, and economy. The state has long played a leadership role in protecting and restoring our water, and Governor Dayton is right to call for further action on a variety of urgent water quality issues in our state. Campaign Goal – To fervently advocate for transformational solutions that will protect and restore Minnesota’s waters now and forever. The Clean Water Act was passed in 1972. Minnesota’s governmental agencies have had oversight authority over Minnesota’s water quality for decades. Advocacy groups have worked in the public interest to improve water quality for just as long. Then why are the efforts to protect and restore our state’s waters not matching up to the challenge? Power and politics is why. The public health and the environment are pushed aside while polluters make deals with politicians, get a free pass, and push the costs of cleaning up our waters off to the rest of us. Campaign Goal – To hold polluters accountable to clean water standards and responsible for the water quality degradation they cause. And to demand real corrective action from those who are charged with holding polluters accountable. 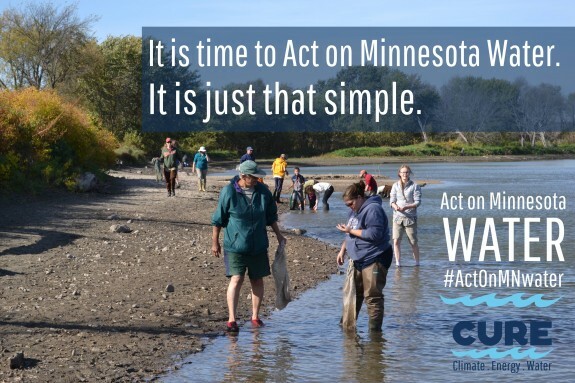 Join the Act On Minnesota Water campaign in supporting the governor’s leadership and battle to protect and restore Minnesota Waters. Make your special contribution here, and join us to Act on Minnesota Water!